Using a gene-editing system that was originally developed to delete specific genes, researchers from MIT developed a new technique to reliably turn on any gene of their choosing in living cells. This new application for the CRISPR/Cas9 gene-editing system should allow scientists to more easily determine the function of individual genes, according to Feng Zhang, the W.M. Keck Career Development Professor in Biomedical Engineering in MIT’s Departments of Brain and Cognitive Sciences and Biological Engineering, and a member of the Broad Institute and MIT’s McGovern Institute for Brain Research. This approach also enables rapid functional screens of the entire genome, allowing scientists to identify genes involved in particular diseases. In a study published in the December 10 online edition of Nature, Zhang and colleagues identified several genes that help melanoma cells become resistant to a cancer drug. Silvana Konermann, a graduate student in Zhang’s lab, and Mark Brigham, a McGovern Institute postdoc, are the paper’s lead authors. The CRISPR system relies on cellular machinery that bacteria use to defend themselves from viral infection. Researchers have previously harnessed this cellular system to create gene-editing complexes that include a DNA-cutting enzyme called Cas9 bound to a short RNA guide strand that is programmed to bind to a specific genome sequence, telling Cas9 where to make its cut. In the past two years, scientists have developed Cas9 as a tool for turning genes off or replacing them with a different version. In the new study, Zhang and colleagues engineered the Cas9 system to turn genes on, rather than knock them out. There have also been attempts to use CRISPR to turn on genes by inactivating the part of the Cas9 enzyme that cuts DNA and linking Cas9 to pieces of proteins called activation domains. These domains recruit the cellular machinery necessary to begin reading copying RNA from DNA, a process known as transcription. However, these efforts have been unable to consistently turn on gene transcription. Zhang and his colleagues, Osamu Nureki and Hiroshi Nishimasu at the University of Tokyo, decided to overhaul the CRISPR-Cas9 system based on an analysis they published earlier this year of the structure formed when Cas9 binds to the guide RNA and its target DNA. “Based on knowing its 3-D shape, we can think about how to rationally improve the system,” Zhang says. 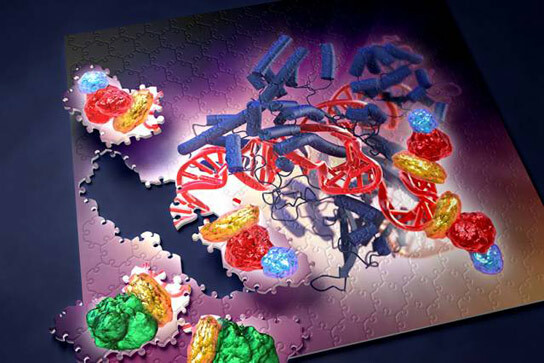 In previous efforts, scientists had tried to attach the activation domains to either end of the Cas9 protein, with limited success. From their structural studies, the MIT team realized that two small loops of the RNA guide poke out from the Cas9 complex and could be better points of attachment because they allow the activation domains to have more flexibility in recruiting transcription machinery. Once the researchers had shown that the system was effective at activating genes, they created a library of 70,290 guide RNAs targeting all of the more than 20,000 genes in the human genome. They screened this library to identify genes that confer resistance to a melanoma drug called PLX-4720. Drugs of this type work well in patients whose melanoma cells have a mutation in the BRAF gene, but cancer cells that survive the treatment can grow into new tumors, allowing the cancer to recur. To discover the genes that help cells become resistant, the researchers delivered CRISPR components to a large population of melanoma cells grown in the lab, with each cell receiving a different guide RNA targeting a different gene. After treating the cells with PLX-4720, they identified several genes that helped the cells to survive — some previously known to be involved in drug resistance, as well as several novel targets. Studies like this could help researchers discover new cancer drugs that prevent tumors from becoming resistant. “You could start with a drug that targets the mutated BRAF along with combination therapy that targets genes that allow the cell to survive. If you target both of them at the same time, you could likely prevent the cells from developing resistance mechanisms that enable further growth despite drug treatment,” Konermann says. Scientists have tried to do large-scale screens like this by delivering single genes carried by viruses, but that does not work with all genes. Zhang’s lab also plans to use this technique to screen for genes that, when activated, could correct the effects of autism or neurodegenerative diseases such as Alzheimer’s. He also plans to make the necessary reagents available to academic labs that want to use them, through the Addgene repository. The research was funded by the National Institute of Mental Health; the National Institute of Neurological Disorders and Stroke; the Keck, Searle Scholars, Klingenstein, Vallee, and Simons foundations; and Bob Metcalfe. 1 Comment on "Gene-Editing System Allows Rapid, Large-Scale Studies of Gene Function"
This sounds like the most fun device imaginable in practice– freely editing the DNA of living creatures without prejudice will most certainly give rise to an interesting array of developments.